Electronic cigarettes — or e-cigarettes — have become increasingly popular in recent years, especially among young people. According to a surgeon general’s report, e-cigarette use among U.S. high school students increased by a staggering 900 percent between 2011 and 2015. As reported by NBC News, these high tech alternatives to traditional cigarettes are often marketed as a “safer” way to consume nicotine. E-cigarettes have also been involved in a startling number of serious accidents, in which they have have literally exploded during use. Although the FDA has not banned e-cigarettes, many safety experts and lawmakers have pressured the agency to take action to reduce the risks posed by the devices. In 2016, the FDA announced it would begin regulating e-cigarettes the same way it regulates traditional cigarettes. Recently, the FDA announced it will also conduct a workshop in April 2017 to “gather information and stimulate discussion” about e-cigarettes. 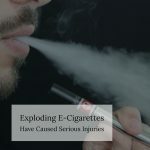 The FDA has identified the battery as the reason for the explosion in 134 documented cases of e-cigarette injuries occurring between 2009 and 2016. Safety experts say there are likely many more unreported cases of the batteries in e-cigarettes causing injuries. The two-day workshop, which is open to the public, will also host scientific and medical experts, as well as e-cigarette manufacturers, distributors, and retailers. New York City defective products lawyer Jonathan C. Reiter. T: 866-324-9211.